The Daewoo Lanos is offered as a two-door coupe and four-door sedan with 1.6-liter, 105-hp 4 cylinder coupled with a five-speed manual transmission. ABS is standard. Gas mileage, easy to drive. expensive parts that break down! This car is horrible! I had it since 2005, to use while in college. I had to fix the transmission (+$1,000), shocks ($350), brakes rotors ($500), replace wires to board ($250 for labor), also the car keeps cutting off and no one knows why. It never lets me down. 30 mpg/ holden motor runs like the wind. Super cold air. Greatests car I ever seen or had. No trouble for over six years. Daewoo did it right A LITTLE MONEY and a super car. The two problems I mentioned. Blind spots due to the wide roof pillars in back. A little bit of wind noise above 60mph. I have had 68000 virtually trouble free miles. Good fuel economy and cold air conditioning. The Crank position sensor went bad (a known problem and recall) which turned the check engine light on a couple of years ago. The thermostat housing broke on the highway today and the engine lost all coolant and overheated, (another known problem). The part to fix it costs about $20.00 and it is an easy fix. I recommend that you buy a spare thermostat housing and keep on one hand, easily found on e-bay, and maybe change it now as preventative maintenance to prevent a problem from getting you stuck somewhere. These little problems aside, it is a nice little car that scoots around town and gets good mileage and I consider it to be as well built as our Honda at a fraction of the price! I have had my Lanos for about 2 yrs now and i couldnt be happier with her! She has a full body and sports kit on her and she fly's like the wind!!! The Lanos is trully an amazing vehicle... i have no problems at all.My suggestion for everyone out there, if you are looking for a great little runabout with balls look for a Lanos. they are fantastic! I have no complaints about my Daewoo Lanos. I purchased it brand new and soon after heard about the bankrupcy and was concerned. I did receive one of my free oil changes which was covered under my warrenty before it was cancelled. I am now getting my 60,000 mile tune up which the dealership recommended I get my timming belt changed first. Other than one recall and one hit and run damaged my driver side door. I took it to the kia dealership and they fixed it right away. I have received updates regarding the status of the parts etc. I was denied insurance from an insurance company once because I had a Daewoo and they thought the parts were not available. I have a great insurance company now and once again had no problems with replacement parts Yet! soft as opel to ride; doesn't rust as it is galvanized, easy to run, comfortable, in a 3 door hatch back more place for passenger than in honda civic. During all the time i'm having my lanos i had to change ingition coil for which i paid just 50$ and for those white handed men i can say hanging very simple. Apart this problem which was solved the same day this car is exellent. This car is for intelligent people who know what they are buying. More over if you daewoo car it doesn't mean that you don't have to take care of the car. 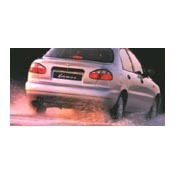 Many talk that daewoo crepitates very much than you should look to the driver how he treats his car. This car as i'm having lanos 3 door hatch back is a good quality car. opel astra, volvo 440, ford fiesta, mitsubishi colt. This is one of the worst inports i have ever drove, no power, uncommfortable, ugly, and for a lil 4 banger didnt realy get that good of mpg. since dawoo when bankrupt there warrenty is no longer any good. and they ahve a major problem blowing heads, CHANGE TIMING BELT @ 60K. traded is off not to long ago. wouldnt buy another one if that was all i could find. expensive parts and low resale value. Please do not rebuy this ca. These cars may run great, but when they tear up it is a hassle to fix them. they have had recalls and i have to drive 2 hours just to find a dealership that carries the parts. My timing belt recently broke and it bent my valves I am left with no value or use of my car and I cannot find the parts to fix it. If you own one of these vehichles please get rid of it ASAP. a regular thermostat for any other car costs $5 Bucks or so, but for the Lanos they cost $45 bucks.